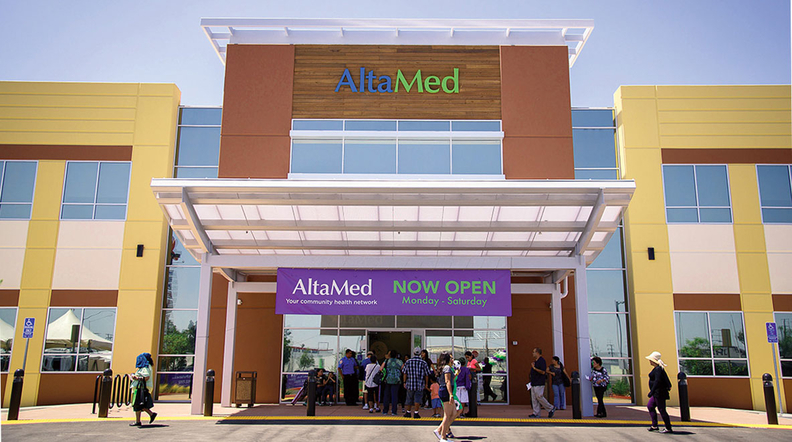 AltaMed Medical and Dental Group-South Gate celebrated its grand opening last August. AltaMed, a Southern California health system, has a storied beginning. In the 1960s, volunteer physicians and nurses served patients out of an East Los Angeles barrio clinic, where they kept a 5-gallon water jug to collect any spare money people could offer. "We've come a long way from a free clinic in the 1960s, then to a clinic of last resort, to where we are today—a provider of choice," said Cástulo de la Rocha, AltaMed's CEO. Today, AltaMed employs a workforce of nearly 3,000 and operates 50 clinics extending from Los Angeles to Orange County. It serves roughly 300,000 patients annually. Soon, AltaMed will also be licensed to run its own health plan—in actuarial terms, to assume full risk. Community health centers and hospitals increasingly find themselves battling over the same patient population. AltaMed does it all. This Southern California medical powerhouse also happens to be a federally qualified health center. Underlying the relationship is increased competition for the same patient population. Over the past three decades, Medicare, Medicaid and commercial insurance have become the dominant payers of community health centers' patients. While this is in no way indicative of the general market, one insurance carrier reported FQHCs accounted for 90% of its primary-care business, said a policy analyst speaking on background. At the same time, health centers have proliferated. 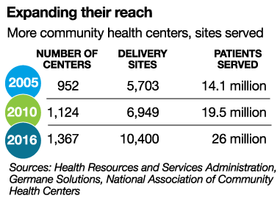 Today, nearly 1,400 community health centers with their network of 10,000-plus sites serve about 26 million people. Congress recently appropriated more than $7 billion over two years to replenish the lapsed funding that pushed more vulnerable community health centers into financial panic. 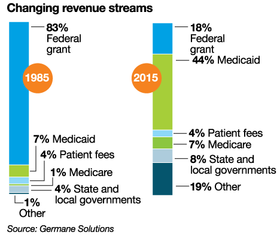 But they aren't as dependent now on the appropriation as they were in 1985, when 83% of a federally qualified health center's revenue came from the federal grant. Back then, Medicaid patients accounted for only 7% of a health center's funding and Medicare patients for just 1%. By 2015, the federal grant represented just 18% of an average health center's funding compared with Medicaid at 44%. Medicare accounted for 7% and other sources, including commercial insurance, accounted for 19%, according to data from consulting firm FQHC Germane, which advises community health centers on business development, grant writing and other areas. Steve Weinman, vice president of the firm, has worked for decades in health centers in his home state of Florida and tracked the on-the-ground story behind the statistics. As he puts it, "We started out loosey-goosey and rarely charged anything, didn't worry about anything beyond our grant funding." Community health centers' transition from being mostly humble clinics to big business was born out of their need to survive in an increasingly complex and expensive healthcare landscape as well as the constant demand for care, Weinman said. Yet as hospitals have learned, competition for patients also leads to competition across service lines. Some community health centers offer the same ancillary services as local hospitals, such as imaging and lab work. Tim Moore, president of the Mississippi Hospital Association, said he doesn't question the need for health centers to compete for patients with a payer behind them, but his members are feeling the tug. "When hospitals, particularly small rural hospitals, are being strapped so hard for revenue, and you're trying to determine how to keep your doors open, if you lose any kind of service that brings revenue into the hospital, it's difficult, it exacerbates the problem," Moore said. In conversations with hospital and community health officials, similar points of friction emerged nationwide. One criticism of community health centers from physicians is the underlying federal statute, which set in place a fee-for-service Medicaid payment model. By law, community health centers receive cost-based prospective payments even if their state uses capped payments for Medicaid. California, for example, reimburses FQHCs for the difference between the managed-care plan's payment and the federal fee-for-service rate. California manages this wraparound payment through what both state officials and providers call a burdensome reconciliation process at the end of each year. Some view the prospective payments as driving poor management of patients' care. Dr. Michael Hochman, an assistant professor at the USC Keck School of Medicine, wants to see FQHCs embrace a value-based model like AltaMed, where he used to work. "With fee-for-service, it's all about getting the Medicaid patients," Hochman said. "If patients are going elsewhere, that's less money for the FQHC." This can lead to over-scheduling of unnecessary visits for patients. As long as they get reimbursed by Medicaid, these often extraneous appointments can be lucrative for health centers, particularly in managed-care states since at the end of the process they will get the extra boost in payment. Meanwhile, Hochman said, hospitals can't compete for those Medicaid patients on the same level because their reimbursement rate is much lower without the advantage of the prospective payment system. But then there's the consideration of rural community health centers operating in a healthcare desert on razor-thin margins. In states with low Medicaid reimbursements but a majority of Medicaid patients—and in towns where a health center may be the only provider—the prospective payment is a lifesaver. In states that didn't expand Medicaid under the Affordable Care Act, the prospective payment can be even more crucial. While alternative payment models would allow community health centers to combine services for a patient during one visit, policymakers would need to make adjustments so a critical part of the healthcare safety net isn't jeopardized, said Rachel Tobey, director of the research group John Snow. Tobey, with USC Keck's Hochman, has been involved in California's attempts to move community health centers to an alternative payment model. "Once you open the door for states to waive PPS protections, if you open it even a crack, you run the risk of driving important safety-net providers out of business," Tobey said. Both community health centers and hospitals can take issue with how mergers happen. Sometimes hospitals acquire community health centers to use as their referral centers or to compete with larger FQHCs. As AltaMed's de la Rocha said, "Now I have hospitals opening FQHCs to compete with me." Or the friction may happen within the community health center sphere. Competition between FQHCs takes many forms, with some clinics blocking new entities from entering a market. Elsewhere, the clinics collaborate just fine. Just as the payer mix is forcing increased competition, it may also be the very thing that spurs collaborations as government payments increasingly reward coordination. As the consultant Weinman said, health centers have to adapt in order to win the Medicaid managed-care contracts in the first place. "We need to compete for large contracts with large providers that will take the payers and send everyone who can't pay to the community health centers," he said. Moore is trying to move past the stalemate of competition and into the hard work of next steps, including solving Mississippi's healthcare access problems. "We've tried to get away from competition and hit the restart button," Moore said. So last year he assembled a coalition of community health centers and hospitals to start a residency program for a specialty-care physician that a single rural provider couldn't afford alone. Moore sees this first collaboration blossoming into support for resident clinicians across various medical disciplines like obstetrics and behavioral health. This kind of effort could bolster the state's entire healthcare system, he said. "Let's bring the FQHCs and rural hospitals together, let's work together and share the cost and expense, share the patients in order for physicians to come to Mississippi," Moore said. Moore isn't alone in thinking this way. In rural North Dakota, critical-access hospital Sakakawea Medical Center and a community health center essentially linked arms under a shared CEO in 2011. "Prior to 2011, there was a very competitive relationship between two organizations," said Derrold Bertsch, who heads both the hospital and health center. The unlikely collaboration happened when the health center was without a CEO and asked Bertsch to come in. Now the two organizations continue to operate as separate not-for-profits with separate governing boards, but they share a few board members and each doesn't offer services that the other facility can do better. For Bertsch, any solution needs to start local. "It's incumbent upon rural FQHCs and critical-access hospitals and their leadership to develop those solutions," he said. As community health centers grow and expand and potentially build collaborations with hospitals, it's unclear how they will fit into a broader landscape that is in the midst of a consolidation frenzy. But it's something Moore and others are thinking about. "In my mind, the role of the small rural hospital is going to look more like the FQHC than it does today," Moore said. "We will be moving away from acute beds in small rural hospitals. It's just not sustainable, and we all know that." De la Rocha said he also sees an increasingly symbiotic relationship between the two. 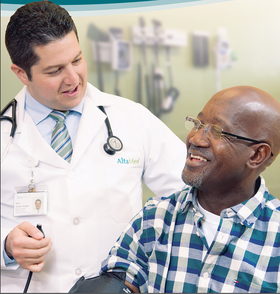 Dr. Ilan Shapiro, AltaMed's medical director of health and wellness, helps oversee care at the system's 50 clinics. AltaMed includes a pediatric clinic attached to Los Angeles Children's Hospital, with whom it partners, and it operates the third-largest Medicare Program of All-Inclusive Care for the Elderly (PACE) in the country—the largest in California. "From my own standpoint, we have something hospitals need," he said. "We have a healthcare delivery system that has facilities and clinics in communities where hospitals aren't located," de la Rocha said. The crucial impact on patients happens in the communities, he added, whether it's managing their diabetes or hypertension. Likewise, health centers need the hospitals' institutional care. However the future looks, Hochman said he wants to jettison the community health center model of a separate safety net and move to a merged system where everyone is treated the same way. "There's a distinction between safety-net provider and commercial providers—essentially two levels of care," he said. "But 1 out of 5 people are now on Medicaid. Why set up a whole different system for people on Medicaid?" As community health centers move away from their safety-net role, that dream may be in sight.